Nothing feels better than walking into a familiar, cozy, memory filled home. This was especially true after spending so much time away recently. I had forgotten/never truly acknowledged how nice our house is...smaller than most, we have more than enough room. It is beautifully decorated (to our taste that is) with memory-inducing and handmade items. Joint projects by Brad and I abound...kitchen table & chairs, accent chair, wooden boxes, dress form, an end table and mini window, plus several waiting in the wings. This summer, when I hit nesting mode, we cranked a lot of these projects out...so I thought I'd share. 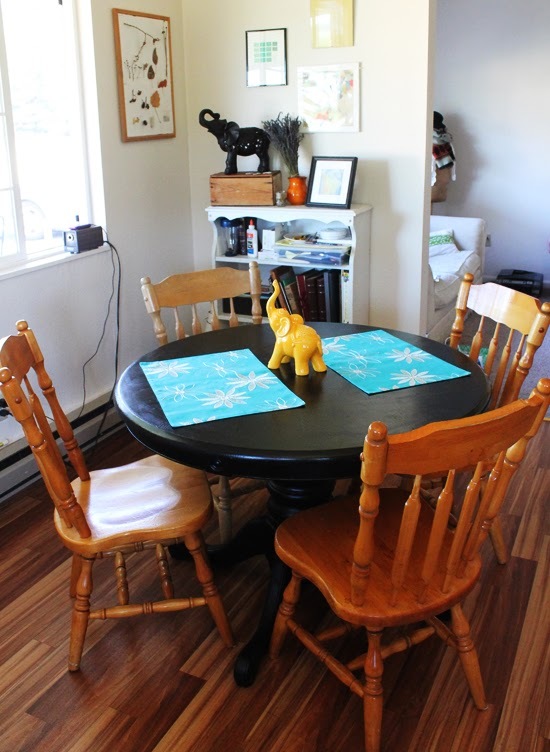 Our kitchen table and chairs were/are hand-me-down from my parents who got it from their parents. That table had gone through a lot, 5 kids, match-stick fires built on top, holes accidentally drilled into the top, fork dents and scratches galore. 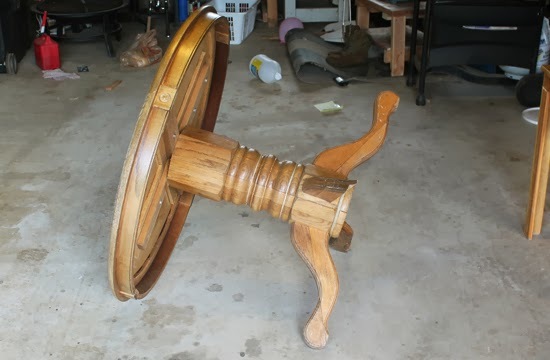 When this donated round oak table didn't sell at our garage sale, we kept it thinking we'd fix it up and try to sell it. The top was so rough that I got a splinter just resting my hand on it! A leg was broken, and the base was being held together with rope and wire. I wonder why it didn't sell? :) Brad did all the structural work, and I got to paint! Not usually one for glossy black, I thought that was exactly what this round table needed. 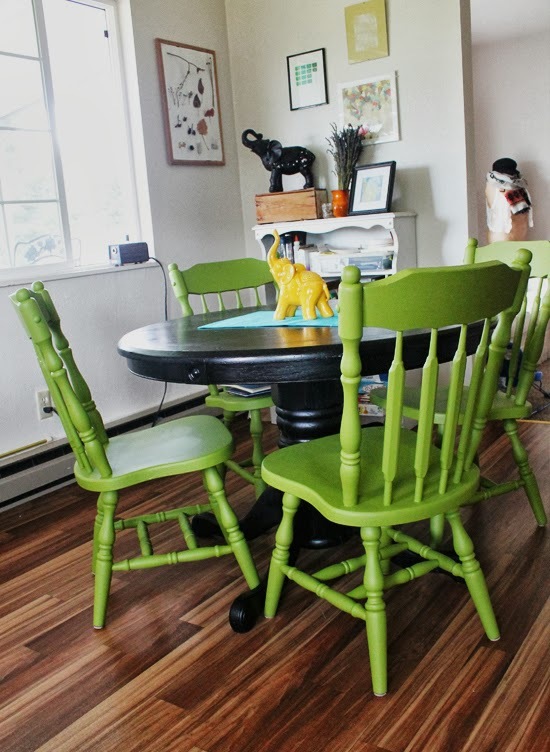 We had talked about changing the chairs...I had originally wanted to paint the kitchen chairs green and keep our table natural wood, but plans change. :) We decided to wait a bit to buy paint because funds only come around so often for projects like this...then my free quart of paint flyer came in the mail. Boom! Paint obtained, and chairs painted. I love colored kitchen chairs especially with the black table. What do you think? 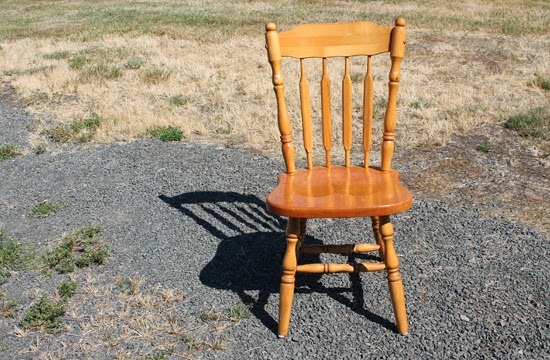 If you could painted kitchen chairs, what color would you choose? I'm on a teal kick recently, that's what color I would have done the chairs in but your green ones look awesome! Good work you two!